When we have over fermented or left over idli batter, normally we make Dosa, Oothappam etc. Instead, we can season the batter and make this spicy idli. Chop ginger, garlic, green chillies, curry leaves finely. In a kadai put the oil and when it is hot add mustard. When it pops up, add the dhals and nuts, asafotida powder and fry till the dhals turn into light brown. Then add chopped ginger, garlic, chillies and curry leaves. Fry for few more seconds. Add this seasoning to the batter. Mix well and make idlies. Serve with chutney, sambar or Idli Podi. Thank you Indhu for visiting my website and your kind feedback. I tried your Thalicha Idli recipe today morning accompanied with Kadamba Chutney, it came out well. combination was also good. Thankq for your wonderful recipes. hi, i am monaa, Ur recipes are too gud. i tried ur brinjal kootu and beetroot poriyal both came out very well . could u please tel me the measurement for dosai and idly? Normally I use 4:1 ratio Parboiled rice: Urad dhal. loved all ur recipes..just awesome!! i want 2 make some spicy mushroom subzi .can u help? Thank you Swati Gawai for your kind words. I will try to post mushroom subzi shortly. Hai kamala gaaru,iam purna all your recepies are very gud,and in health point of view realy super. Thank you Annapurna for your kind words. Thank u very much Auntie i have been hunting for these nutritious south indian recipes for ages. Now my husband is your fan too.Big difference in my cooking. Thank you Rachana for trying my recipes. Hope you will find it useful. Thank you Venessa Pillay for visiting our website and sharing information. Nice..came very well…all appreciated me..good job..keep it up. Thank you Selva Uma for your feed back. am shankari staying in bngle, here rava idly is famous, here all use idly rava. the rava idly u mentioned, for that which rava is suitable, kindly message me mam. Rawa Idli is made from the Bombay rawa or called as Sooji. 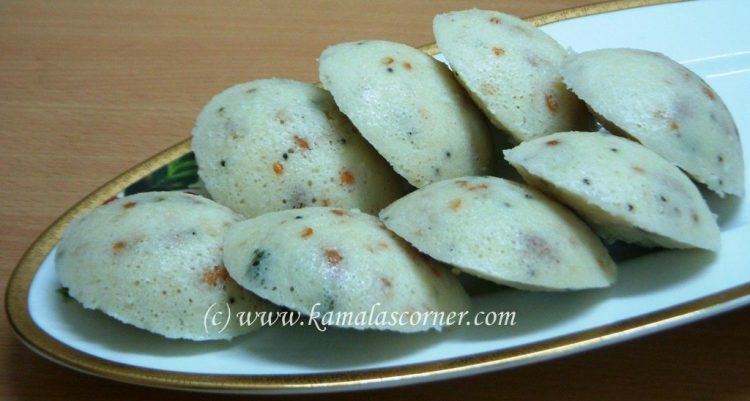 I have posted two types of Rawa Idli which you may check in my website. i am intrested in cooking,but know few recipes you teach me lot,thank you so much………..
thank you kamala garu ., we are 4 friends live in china our family is in india ., we save more money and eat delicious food as we like just because of your recepie . now we cook our self we just follow your process . many more thanks for you . awaiting for new updates very easy and can cook fast process. thank you very much . Thank you Gnananand for your kind words. I will post more easy cooking recipes.